We wanted to create a space that would be 'sacred' for everyone, religious or non-religious. The result is a design that reflects universal values and symbolism of life, time, and humanity. The chapel is a space where people gather to contemplate their walk of life. The broken concentric pattern of the chapel symbolizes fragmented time, and discontinuity in our pathways through life. It binds our experience through nature, light, and gathering. 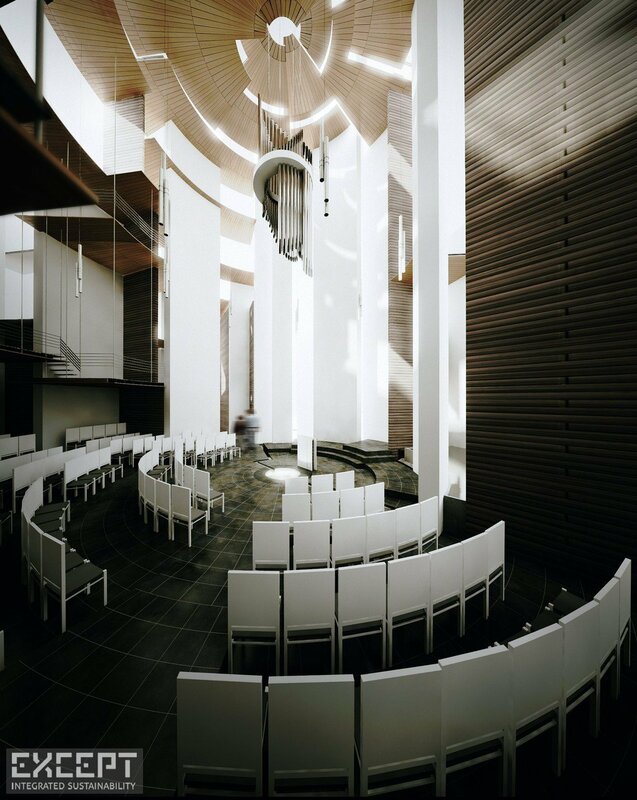 The center of the chapel represents a single axis in space that functions as a beacon from the highway and that is occupied by water, earth and light. From this center, the concentric walls echo out into the landscape creating protected niches, small seating (and thinking) places, processional paths, and gardens. The form of the building guides and enables the gathering of people, while at the same time disconnecting us from daily life, like stepping back from a painting to witness what you have created. 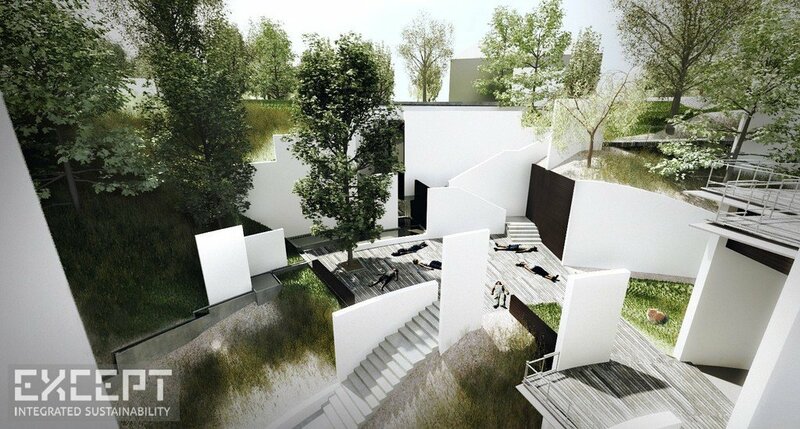 We wanted the space to be engaging in different ways, over time, over seasons, and thoughout the landscape. We reflected the posture of mankind through the verticality of the chapel. The chapel is a complex and ever changing place that is not always easy to comprehend or in which to plan path ahead, as an analogy to how we proceed through life. Most religions, life philosophies and spiritual ideologies have a circle in their symbolism. It could be said that the circle is the one form that binds humanity both in the symbolic meaning (the endless line, expansion of life, eternality) as in the references to all that is important to us (marriage ring, iris of the eye, our planet, the moon and the sun, our source of life). This makes the broken circular shapes of the chapel reflect both one-ness and different perspectives on the same. In our path through our life we often head towards an invisible goal, but rarely can we strive straight for it. We roam the periphery and slowly we come closer to a point that keeps moving, and we will never arrive at. 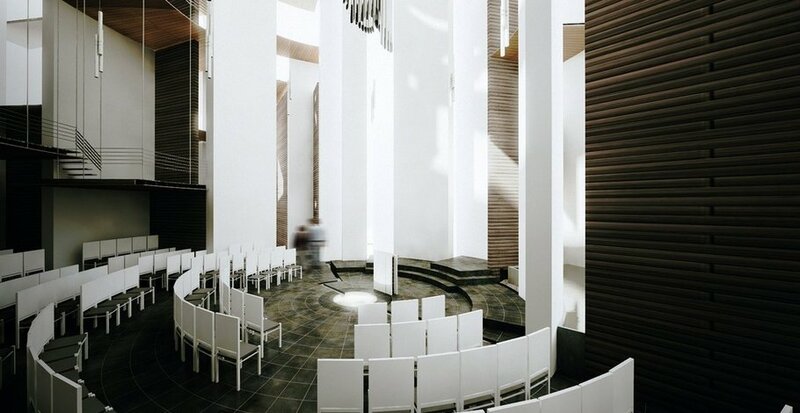 The chapel symbolizes this movement, the choices along our life paths, the interconnectedness of nature, light and water with ourselves. Embedded in the ravine edge the chapel is a glowing beacon for drivers, a ceremonious place of celebration for marriages, a park for the neighborhood stroller, an event for night life party goers, and a creator of identity for the neighborhood, and for Toronto as a whole. 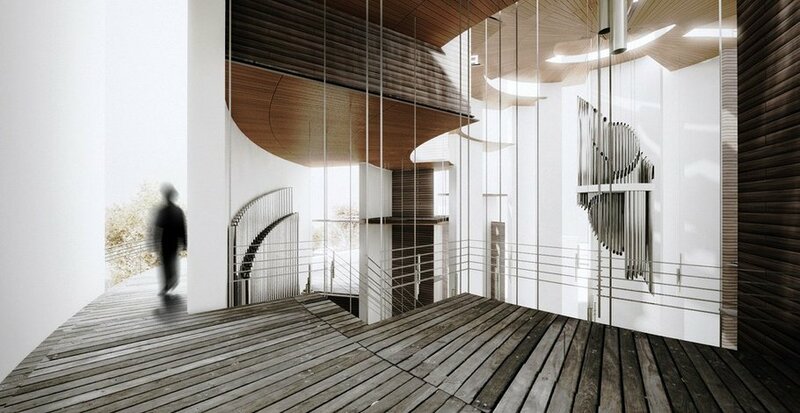 The chapel features a hanging chandelier organ for which Kegg Organ builders was consulted. It is a hollow design, allowing the chapel’s central void to pass through the organ’s center. The structure of the chapel consists of semi-circular concrete walls. 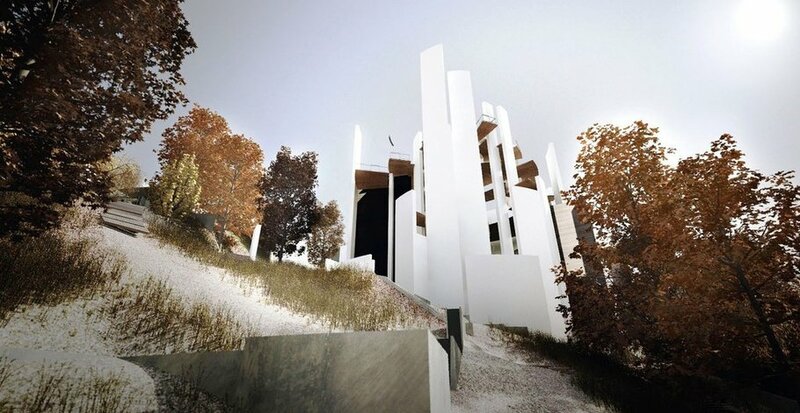 While these function to create the spaces of the chapel, they double as anti-erosion walls that prevent the topsoil from the ravine to wash away, a problem that’s been damaging the area for decades. This creates a new eco-region that can grow and develop using indigenous plants that otherwise would not stand a chance. 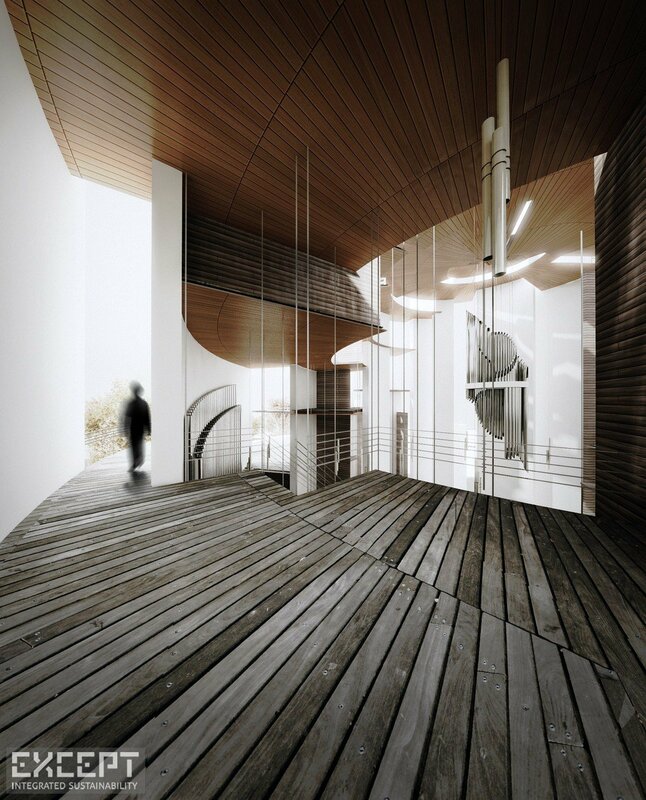 All other materials of the building are made of local natural wood. All heating, ventilation and water treatment is performed on-site and autonomously. These innovations also play a role in the symbolism and atmosphere of the site and building. For instance, rain water is collected at the top of the ravine, and trickles down small channels that run alongside paths to merge the element of water in the symbolic procession. They also irrigate the landscape and make for an anti-erosion runoff system. The materials are chosen to show the passage of time, and to allow the building to receive new meaning as the world around it changes. The solid concrete walls will stand the test of time much longer than the wooden floors and radial walls, allowing the building to become an abstract memory in the landscape in a distant future. 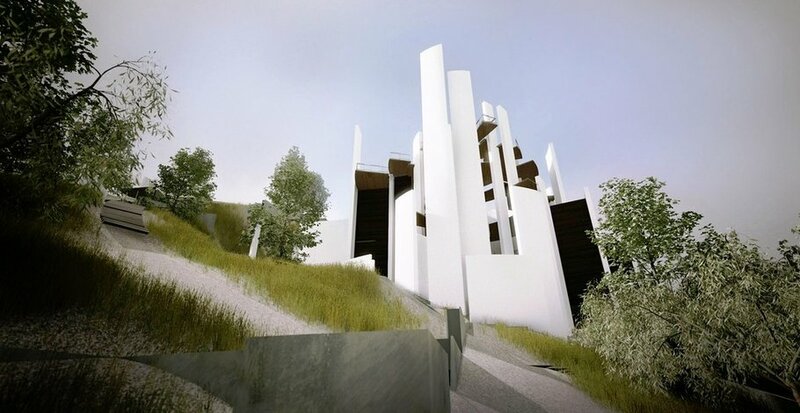 Much after the function of this building has ceased to exist, the white walls will keep the ravine from eroding, protecting its ecosphere, and stand as a testament for human gathering. 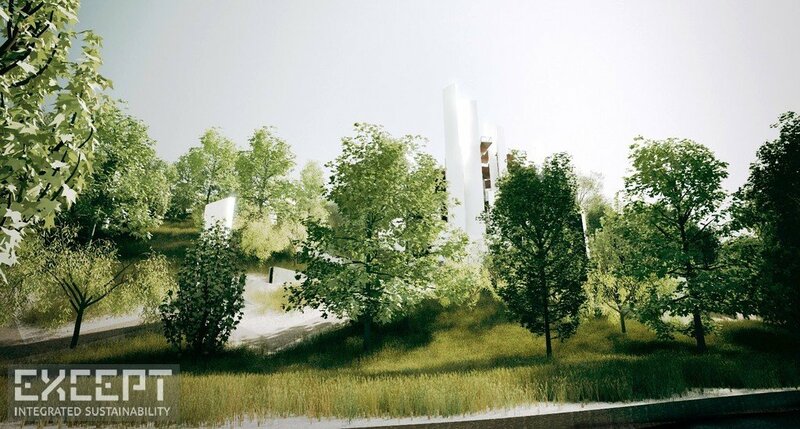 Centrum embeds itself in the ravine ecosystem, changing with the seasons. The central chapel's space brings a reverential experience to visitors. 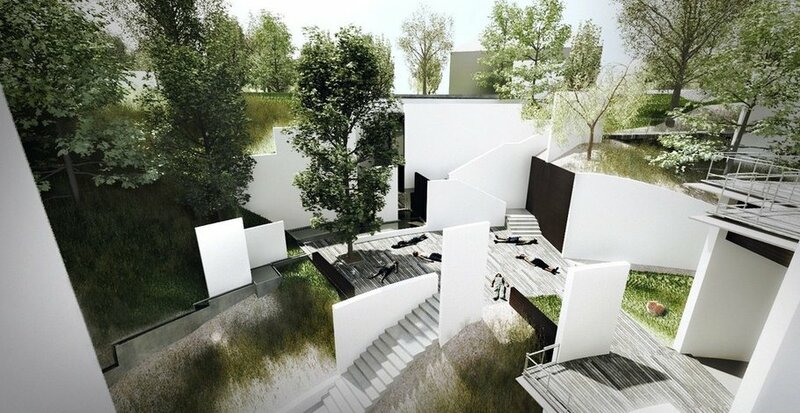 The landscape allows for a multitude of uses and experiences. The chapel becomes a beacon of recognition when seen from the local highway. 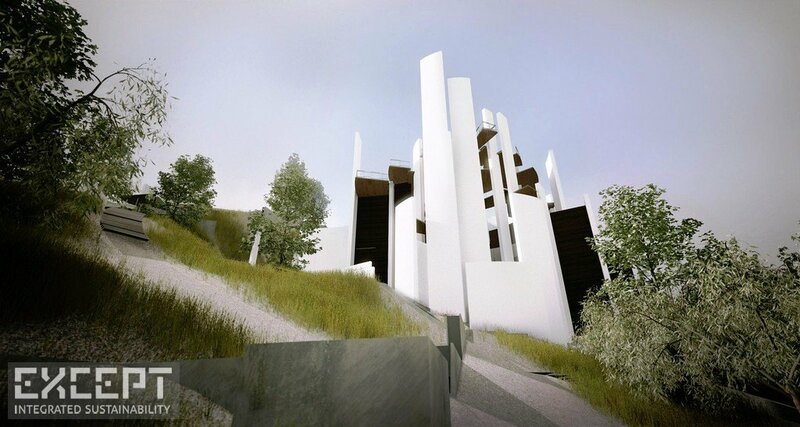 The chapel offers five entry points at different levels, enabling a variety of experiences. The chapel prevents erosion through the smart placement of retaining walls.